Great expierence & I left my shawl & it was returned promptly. Quite a lovely visit during a wet stormy time of year. I love renting from you. The gifts are nice. Love Sleepy Monk Coffee, the mugs are nice also. We have visited cannon beach many times and stayed at a variety of hotels and vacation rental houses. 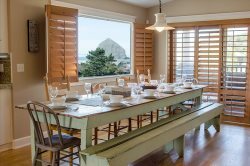 Our experience this time around was wonderful, and we will definitely use Cannon Beach Vacation Rentals on future visits! Very friendly, helpful, and accommodating staff on phone & in person. We will definitely return!